Kuwait owns an important part of the Mesopotamian Delta – an ecosystem of vast flat muddy islands and river-like tidal channels, in the northeast corner of the country sandwiched between Kuwait’s mainland, Iraq and Iran. Bubiyan is a remarkable deltaic island covering an area of 863 km2. The landscape here is almost totally flat and the waters are a sediment laden and cloudy brown in colour. Tidal mudflats, sabkha and salt flats seem endless. Yet these waters and sediments are fed from the Tigris and Euphrates rivers that pour into the Gulf via the Shat al Arab channel. The result is a wetland wilderness rich in wildlife, definitely one of the most amazing natural treasures in the country. In terms of its birdlife this is an internationally important area for breeding Crab-plover, holding one of the world’s largest colonies; 1500 active nest holes were recorded here in April 2004. Bubiyan also hosts breeding populations of Swift and Lesser Crested Terns, Slender-billed Gulls and important colonies of hundreds of herons, egrets, spoonbills and other waterbirds. In the past flamingos and pelicans nested here but they may have been displaced by human persecution – these colonies are extremely sensitive to disturbance. Bubiyan, Warba and the surrounding delta area is one of the least researched wildlife habitats in the northern Gulf since it is near the notorious tri-border area, for a long time considered a kind of no-man’s land. Being understudied, important wildlife discoveries can still be made. Like Warbah, the island and adjoining islets and inlets share a scene of vast mud tracts. The life-rich mud was deposited here by river sediments coming from the Euphrates-Tigris River waters. Bubiyan is the largest island in Kuwait, located on the western side of the Shat Al-Arab in the north-western corner of the Arabian Gulf. Khawr Adb Allah, a long river-like inlet separates the island from the mainland and from the mainland in the southwest by Khawr As Sabiyah (Khawr or Khor is an arabic term roughly refering to various forms of tidal inlets). Bubiyan is linked to the mainland by a 2.38km concrete girder bridge over the Khawr built in 1983. A port is now being developed on the south-eastern side of the island and new road and railway bridges are under construction. The northern half of the island will remain protected, but this new development will undoubtedly impact the biodiversity found on this island and its adjoining waters. According to Gregory (2005), both Warbah and Bubiyan Islands are famous in the ornithological history, having first being visited and studied over 100-years ago. Many Raptors, Waders, Gulls, Terns and terrestrial migrants pass across the islands during migration, whilst many species breed during the summer. The status of breeding birds is known on Bubyan and breeding species include; Western Reef Heron, Grey Heron, Eurasian Spoonbill, Gull-billed Tern, Swift Tern, Caspian Tern, Kentish Plover, Slender-billed Gull and a significantly large population of Crab-plovers. However through on-going surveys in collaboration with the Kuwaiti Coastguard, data should continue to be collected, so that the development impact in the south of the island can be better assessed over time. Also the IBA qualifying criteria must be re-assessed for this key breeding site. For example, reports of up to 19 Great Knots in both the winter periods of 2004 suggest that this rare species may occur with some regularity. As Warba and much of northern Bubiyan are within a military area they have not been surveyed frequently and as a result are poorly understood in ornithological terms. It is therefore not surprising that despite the area's potential, much of it is not fully explored or recently assessed for its conservation value. As recently as 1994, BirdLife International did not include this area in its first inventory of Important Bird Areas because of the “scarcity of information.” Although records are sparse it is obviously an internationally important area for wildlife – not just for birds, but also for estuarine fishes, crustaceans, sea snakes, sea turtles, sharks and dolphins. Part of Bubiyan is being developed into a port facility and new bridges have been built in the southwestern part of the island, perhaps its status as virtual no-man’s land will change in the near future and it is hoped that legislation will protect and set aside large conservation areas here. Initial reports state that it is worthy of global recognition as a Wetland of International Importance within the Ramsar Convention. This area is part of the vast Mesopotamian Delta Ecoregion one of Western Asia's most important areas for biodiversity. 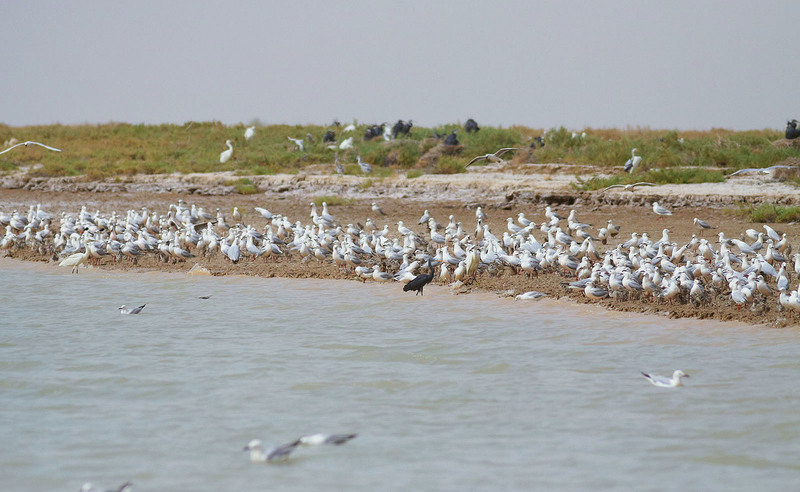 Kuwaiti's part of the Delta is a wildlife hotspot, but much marine wildlife is not easy to see in the turbid nutrient-rich waters. Invertebrates and Mudskippers species inhabit the vast mudflats. The water of the channel inlets have important concentrations of fishes and are nursery grounds for shrimp. Sea snakes and sea turtles visit the area seasonally (sea snakes during the summer months only). Indo-pacific Humpback Dolphins and Bottlenose Dolphins are frequently spotted in these murky waters. Although shark numbers have dropped in the region some species do visit the area (and these include Bull Sharks, a species that used to enter Mesopotamian rivers as well). Arrange quarterly surveys to further understand migration weekly surveys during breeding season and for proclamation as an IBA.